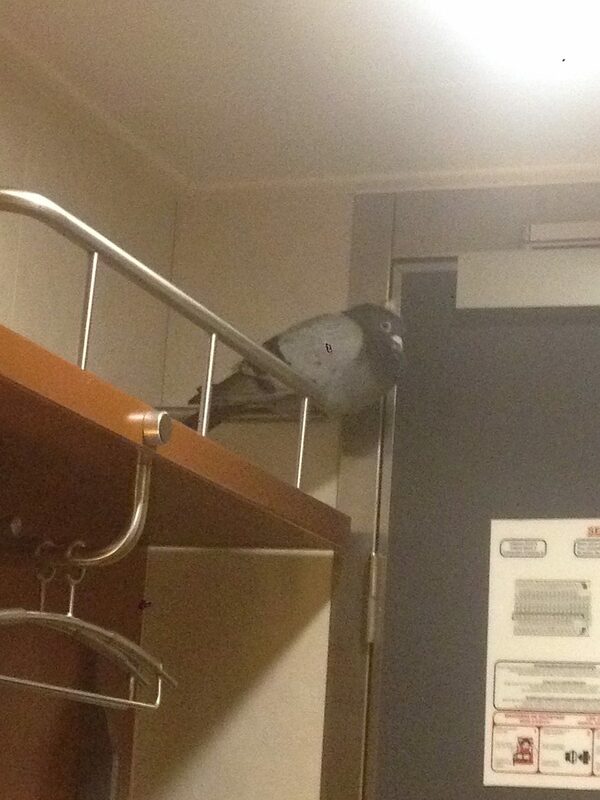 The next morning, on the way from my cabin to the bridge, I spotted by chance a sleeping, oiled and soaking wet racing pigeon sitting in one of the port holes. 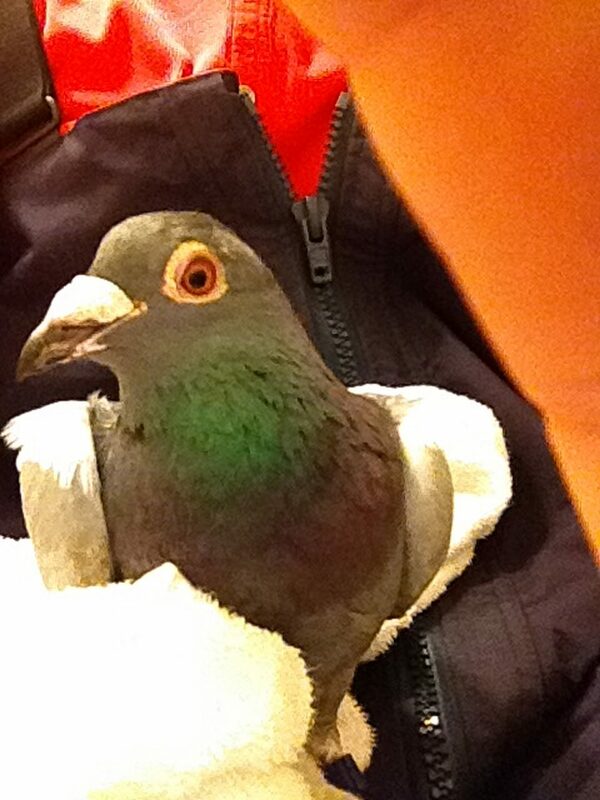 The bird was cold as ice and didn’t wake up when I scooped her up. I wrapped the animal into towels and brought her back into my cabin to warm her up. 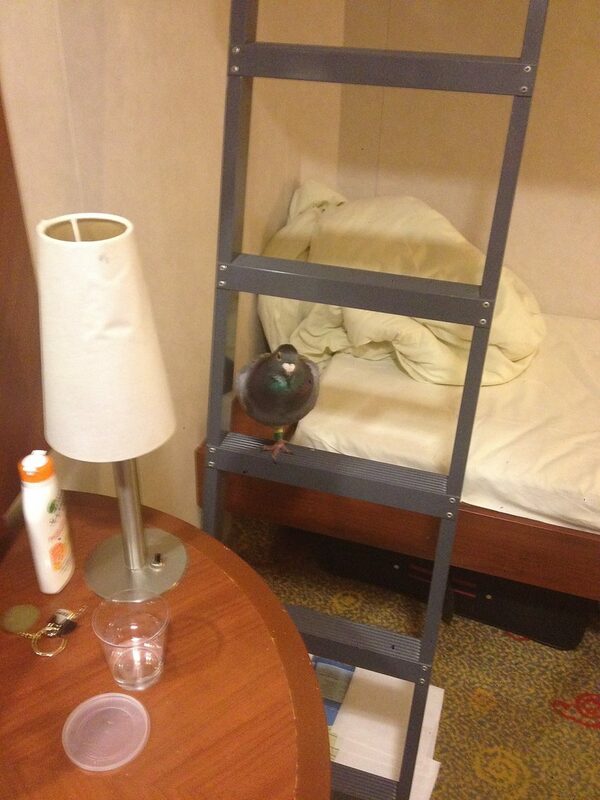 The pigeon, who I named Biscay, has been found in the middle of the Bay of Biscay, about 100 km offshore. Unlike her comrades, Biscay luckily managed to land on board of the ship during her battle with high winds and rain, being completely exhausted, dehydrated and tired, after many hours of non-stop flying following her release somewhere near Barcelona. Biscay is not a wild animal, Biscay is a pet! She has never learned the required skills to find food and water in the wild. Biscay was about to die a lonely and prolonged death, far away from her loved ones. 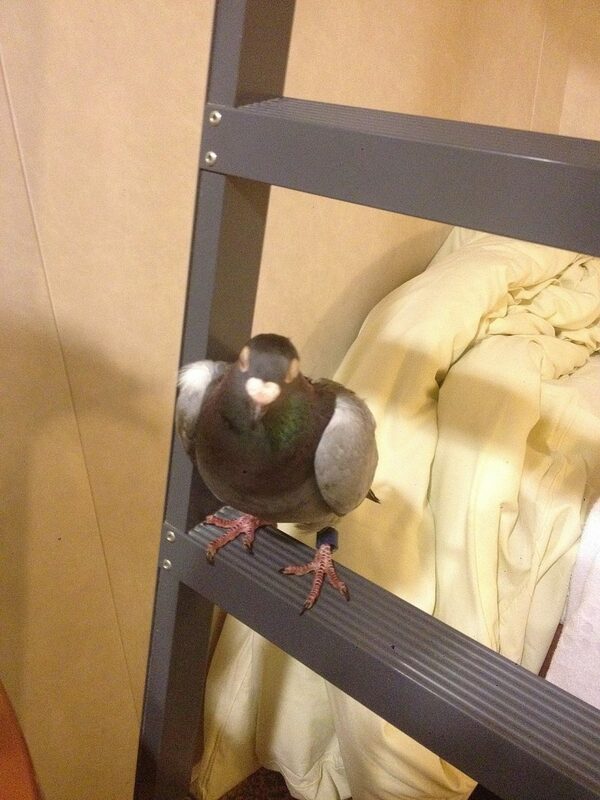 Biscay is a pet, who has been neglected by a so called pigeon fancier, her ‘owner’. She has been intentionally being put through this deadly ordeal, which is legal and not being regarded as animal cruelty by existing insufficient animal welfare legislation. 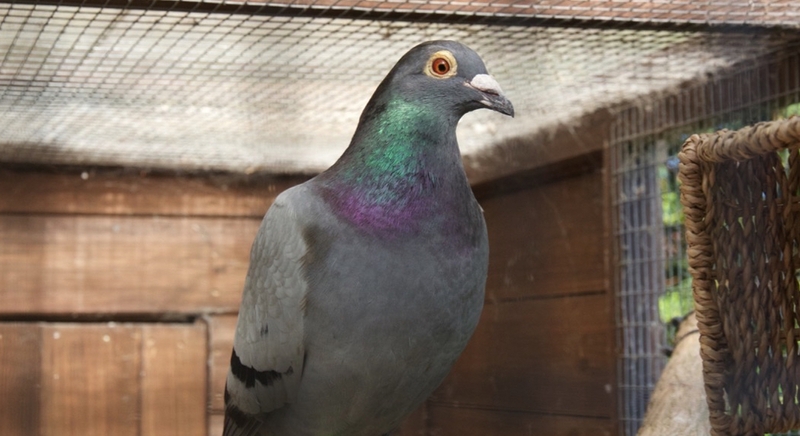 Any other pet ‘owner’, who would abandon his or her pet, leave a dog in a hot car or deprive an animal of food and shelter, would be happily being reprimanded by relevant institutions, but not a racing pigeon fancier. A later phone conversation with the owner of Biscay was rather chilling. It became quickly apparent that the owner was not interested in taking Biscay back. The owner was not willing to pay any expenses towards treatment and upkeep, but suggested to wring the neck of the ‘worthless’ bird. When I voiced my concerns, the owner suggested to let the bird go, despite Biscay’s ailments, implying that she might perhaps find a feral flock she could join. It became very obvious what would happen, when Biscay would manage to return home, when I would release her. She would be killed straight away, as she went off course and didn’t make it back home in good time. Biscay has failed, although she is a sentient being and not an object, she is not worth keeping or breedIng. And this is legal as well! Pigeon racing is a blood sport in which specially bred and trained pigeons are released from specific locations. They then race back to their home lofts. There are various methods of ‘perfecting’ a pigeon’s natural homing capability, and there are various schools of thought on the process. Some pigeon fancier feel that keeping a pigeon separated from its young until it proves his or her homing ability, and using its natural maternal instinct as a reward, is highly effective. 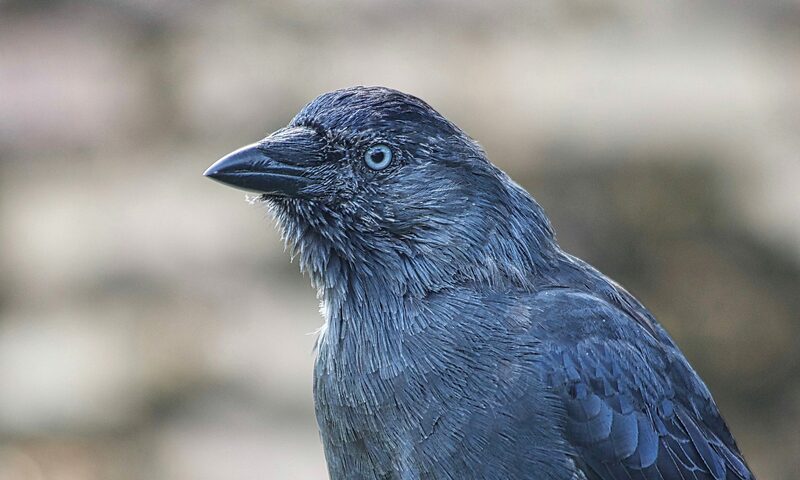 Others also cruelly manipulate the birds with a practice known as “widowing”, where they separate lifelong mated pairs so they will fly back to the loft even faster. There are about 42000 pigeon fanciers in the UK, with up to 2.5 million birds bred each year. The racing season in the UK starts around the beginning of April with the old birds competing first in short distance races. As the season progresses and the weather improves the racing distance increases. South road organisations racing across the channel usually have a continental race one weekend followed by an inland one the next. Alternating between channel and inland racing in this way allows the pigeons to have a rest between the hardest races. Once old bird racing is finished there is a week’s break and then young bird racing starts around the middle of July. A typical season consists of around twenty races, twelve for old birds and eight for that year’s youngsters. The majority of young bird races are inland, although some organisations may include a channel race in their programme for young birds. The longest race for the UK is from Barcelona in Spain and is considered to be a real marathon for British birds. The challenge of navigating the Pyrenees, traversing France and then flying across the Channel back into the UK is the ultimate test, involving many hours on the wing. In such long distance pigeon racing the birds will encounter many different weather patterns, wind speeds and directions. Particularly noticeable is the increased wind speed over the English Channel as the wind picks up strength over the water. Birds will fly close to the water’s surface to avoid winds at higher altitudes and are in danger of being swept into the sea by waves and drown. If they make it to land they are vulnerable to predators and cannot feed themselves because they have been bred in captivity and fed commercial foods. It is frightening and ‘unnatural’ for any pigeon to fly over water when the bird can’t see land on the other side. Pigeon racing is inherently cruel and cross-channel racing is the worst. It is being thought that about 75% of birds never make it home, with some races recording 90% loss rates. 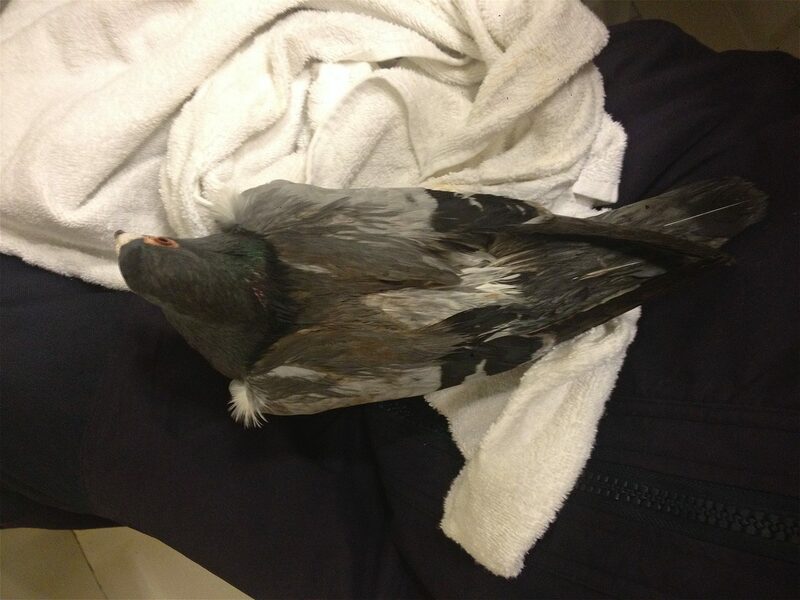 Birds, which prove uncompetitive have their necks broken, are drowned or gassed in car exhausts. I have never known a pigeon owner who did not love thier pigeons more than life itself. I am not sure about the owners of pigeons in this example. Thank you for taking such great care and showing Biscay much deserved love and respect. Speciesism is rampant in this world in so many wsys. It does seem to be getting better (I hope). This is the least we can do, taking care of each other and providing help if we can. Although it sometimes doesn’t feel like it, but I too believe that we shouldn’t give up hope that things will improve.